Breaking Barriers is a small organisation which supports refugees into employment and education. At the end of March, they are launching a new Delivery Centre in Hammersmith. They are looking to recruit volunteers to provide 1:1 advice and guidance to refugee clients in this centre. Ideal candidates are local people who have experience working in London, and are able to share this knowledge with refugees from a range of countries. The commitment is a couple of hours each week or fortnight. You can see more details of the role here. Interested people are invited to attend a “group screening induction event” on Wednesday 27th March at 10am. Anybody interested should email volunteer@breaking-barriers.co.uk or complete the application form. This sounds really interesting and is a great opportunity to meet and support newcomers to our community. 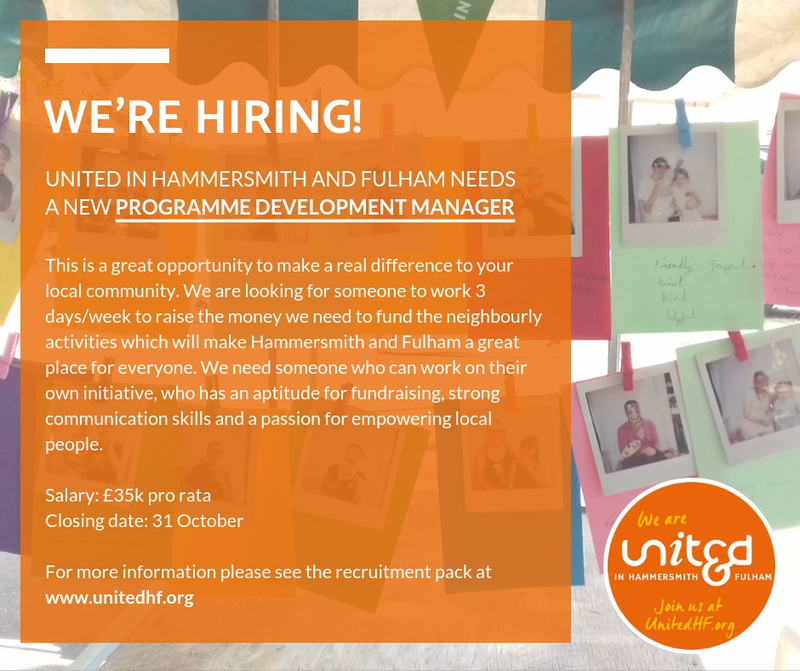 UNITED is a Hammersmith and Fulham based charity which has been created by the merging of two long-established trusts serving Hammersmith and Fulham respectively. Hammersmith United Charities (HUC) and Dr Edwards and Bishop King’s Fulham Charity (DEBK) are both grant-making trusts who work to “relieve need” in their respective areas. 18 months ago, as part of their joint 400th anniversary, they came together to create a new entity to rebuild the tradition of local philanthropy which has made their work over the last four centuries possible. Now they are looking for a programme development manager. The pay is £35,000 pro rata for 3 days per week plus pension contribution. The position will be based at Sycamore Gardens, Hammersmith. What a fantastic opportunity for a local person who wants to work in and enhance our local community. Here’s the link to their website. Here is more info. on the current job opportunity. Roll up! How long does it take Hammersmith & Fulham Council to build a house? 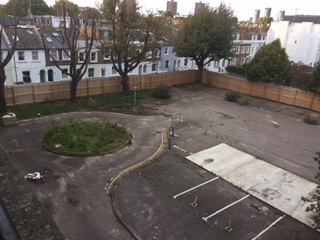 When Labour took over Hammersmith & Fulham Council in 2014, they inherited from the previous Conservative administration, planning permission to build 12 new homes on an ex-carpark on the Springvale Estate in Brook Green. Hoardings had gone up around a large space – forming an unattractive outlook for residents in nearby blocks on the Springvale Estate and in neighbouring roads. At least we could all look forward to the hoarding coming down and 12 new homes. However, four and a half years later the hoarding is still up and there are no new homes. As residents have said to me, all they have had for four and half years is a hoarding, a rubbish dump, and narrow walkway that is convenient for drug-dealers. development of the new housing on the old carpark on the Springvale Estate? If that is too vague, please could you provide me with all the reports that discuss the plans for, progress on, and delays to this development over the last calendar year? Well that is that then. Why don’t they just pull the hoardings down? Except that there is a housing crisis. The Olympia redevelopment team have recently presented their proposals for a planning submission to local residents during public exhibitions, a requirement of the planning process. As local residents (and architects) we’re keen to see a successful scheme that sustainably improves the public realm for the future. The redevelopment could be an energiser for the streets and public spaces around it, for local businesses and public facilities. All involved have a responsibility that should not be taken lightly and the proposals should not be rushed through the planning process. They need close attention from all those that will be affected. The exhibition material highlighted some of the important civic issues and it was instructive to see how much or how little the proposals have addressed these. Our appraisal focuses mainly on the civic realm; those public spaces where as citizens we are free to move, rest, meet or wander. The buildings of the Olympia site act to enclose and embrace these public spaces. The scale of the buildings, occupancy and attractiveness will have a combined effect on the viability and amenity of the whole neighbourhood not just Olympia itself. Public amenity and what the development provides to the community therefore, follows from the creation of civic urban design. If done well uses, both socially focussed as well as commercial, have the best opportunity to thrive in and around a variety of carefully designed public spaces. The redevelopment will create a certain character of place that will be with us for generations. The sustainability of Olympia’s internal re-organisation is addressed with reference to the effects, positive or negative, on the civic realm over the long-term. What follows are observations on the proposals provided at the exhibition on 4th September at the Pillar Hall in Olympia. The impact of increased pedestrian and traffic access needs careful analysis. To mitigate increased pedestrian flows to the significantly large building extensions and to make each individual building relate to the public realm, entry-points for pedestrians need to be carefully placed around the whole perimeter of the site to correspond to the location of the individual building (ie access to the Olympia Central building should principally be from Hammersmith Road on the building’s central axis). Logically placed, generously sized and designed entry-points will avoid pinch-points and congestion at a limited numbers of entries. Making more of the arrival point for those using West Kensington tube station will improve the proposals (see ‘Public Space and Access’ below). The concept of a dedicated servicing traffic entry-point on Blythe Road with some egress onto Hammersmith Road seems rational. However only careful specialist analysis of vehicle numbers, vehicle size and turning circles will provide a sense of how this will work in practice. Traffic congestion and associated pollution as a direct result of exhibitions at Olympia is a significant problem. Independent air testing should be in place to monitor the current situation and to compare the operation of the re-developed site with statutory controls made available if pollution increases. Evidence of the efficacy of the proposed vehicle control software should to be provided as this instrument is the only protection against the rise in vehicle numbers causing further congestion around the site. Planning conditions should be applied to restrict vehicle numbers in the event of a breakdown in this system when in use. What contingencies are in place to deal with extra-ordinary occurrences such as a vehicle breakdown blocking the main underground access point? Is a linear waiting area needed in the area (eg. the north side of Hammersmith Road between Hammersmith gyratory and Brook Green)? Introducing bulky street furniture and over-sized kerb splays at junctions to allow the free-flow of articulated lorries around the site should be avoided as this degrades the spaces for comfortable use by local pedestrians and cyclists. What measures are in place to avoid an increase in personal vehicle traffic around the site? Is there significant provision for secure cycle storage in and around Olympia and if so, where and what will it look like? This is the principal artery linking Hammersmith and Kensington ‘town centres’. 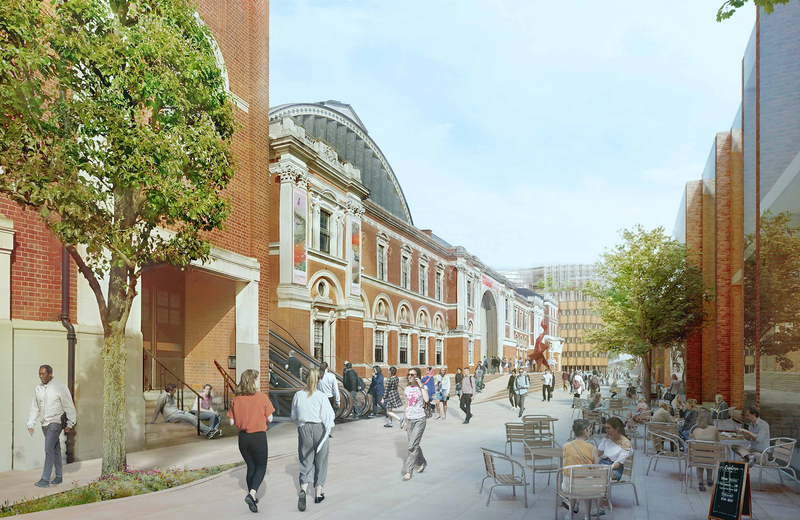 Active frontages, logically sited pedestrian access points and a variety of functions are needed along this street frontage which only comes to life during major exhibitions. The opening to the high-level ‘sky-garden’ proposed is welcome but on its own is not enough to bring the whole site frontage to life. The junction with North End Road is a key intersection. There are long views towards the site along North End Road. The open and inclusive identity of Olympia needs to be expressed here as well as at other key vantage points. There is an opportunity to provide a larger set-back from the street to create a very viable and visible public space at this end of the site that also extends the street tree line. The space provided lacks generosity or a real intention for people to gather here (it offers exits from a bin store). There is now a chance to co-ordinate and dovetail spaces with the neighbouring re-development of No.66 Hammersmith Road (planning application now with the council) and Lyons Walk to maximise clear and open public space, public access and engagement. New publicly accessible functions within ground level frontages will be the catalyst for energising a newly configured public space. This opportunity seems to have been missed so far. Potentially this would become the main pedestrian public space serving the re-development (albeit one owned by Olympia). Importantly, it fronts both Hammersmith Road and High Street Kensington with their transport options as well as Olympia train/tube station. Maintaining this as a publically accessible, open plaza will give the redevelopment a significant urban presence. Views of the vaulted roof of Olympia Grand will help define this key public space. The proposal to remove the one/two storey additions on the historic building frontages is a positive decision and opens up this narrow space. Whilst providing some sense of enclosure at the northern end, the new buildings illustrated seem to narrow the space into an arterial thoroughfare not a plaza. Carefully considered trees, planted in the right places, would assist a sense of enclosure without narrowing the space in front of Olympia Grand. Perhaps a carefully placed array of architecturally interesting kiosk buildings could help buffer the plaza from the train lines perhaps with an additional green wall. Something to generate real visual excitement and possibly commissioned from renowned designers. They could serve as premises for emerging and innovative food businesses directly accessible to the passing pedestrian. There is a great opportunity to create a further expanded public plaza with the roof of Olympia National along Olympia Way being used as a grand terrace overlooking this plaza. We would urge further engagement with Transport for London as adjacent landowners to maximise the civic potential of this part of the site. The potential to enhance the pedestrian bridge over to Russell Road should not be ignored as this is another opportunity to make the site accessible to the wider urban community and activate the space for pedestrians. Contradictory information on the development’s proposed ‘Pillar Square’ has been presented. Provisionally a ‘public space’ this has the site’s power-plant built within it. Likely it will become an arterial access point at certain times of the day only for pedestrians. Allowing access through is a positive proposal. However the development could provide a linear, and truly, public space of 10-12m width parallel with the pavement extending an existing space from Olympia West towards Beaconsfield Terrace without compromising a servicing access point at one end. Provision for children’s play and/or art work would be welcome on this more residential side of the development. The redevelopment of the car park site is welcome and should include active frontage at least at ground level. A publically accessible activity in the part of the block that faces back to Olympia Way is critical in the success of the public space. This needs much greater sensitivity. The Olympia Central re-development is simply too large. Storey heights provided by the consultant team are misleading. The 10 storeys above the existing Olympia Central building (an equivalent 6-7 storeys) will amount to a building of at about 17 conventional storeys high (ie a tower block). This will compete on the sky-line with Olympia Grand. No contextual architectural elevations or street sections of the development were apparent during the consultation. The limited 3d renderings were selective and so the neighbours need more detailed and rigorous information in order to better assess the proposals here. This should be a landmark building within the new development and a better long-term solution needs to be found. In terms of bulk it may be that the developers do not expect to be granted the amount of floor space proposed as some cynics claim it’s not uncommon for an unfeasibly large development to be presented as an opening gambit in an anticipated negotiation. It’s hoped that this type of game would be countered robustly by planning officers. 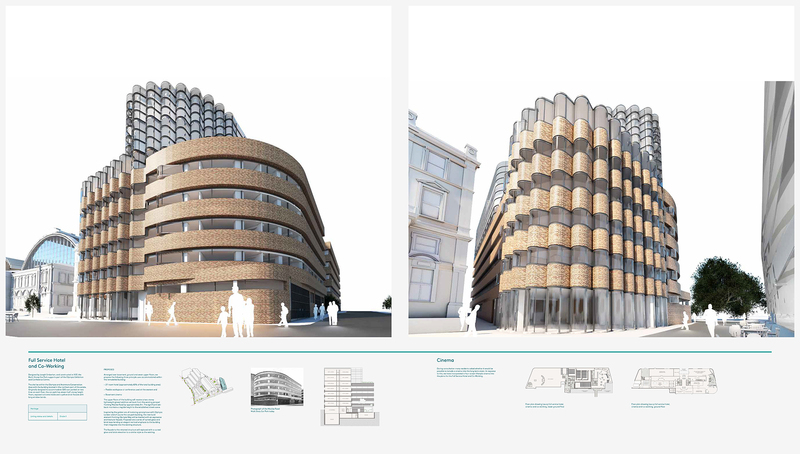 In addition, in the information presented, the stylistic approach chosen for the Olympia Central additional storeys seems to bear no visual connection, resemblance or affinity with the existing listed façade. A more refined dialogue between the monolith-like façade of the Olympia Central building and what is built on top should be clearer in the proposals as well as some restraint in bulk. This may find more favour with neighbours. What they should inherit is a view of an enhanced, beautiful building not a gargantuan design compromise which is the danger here. 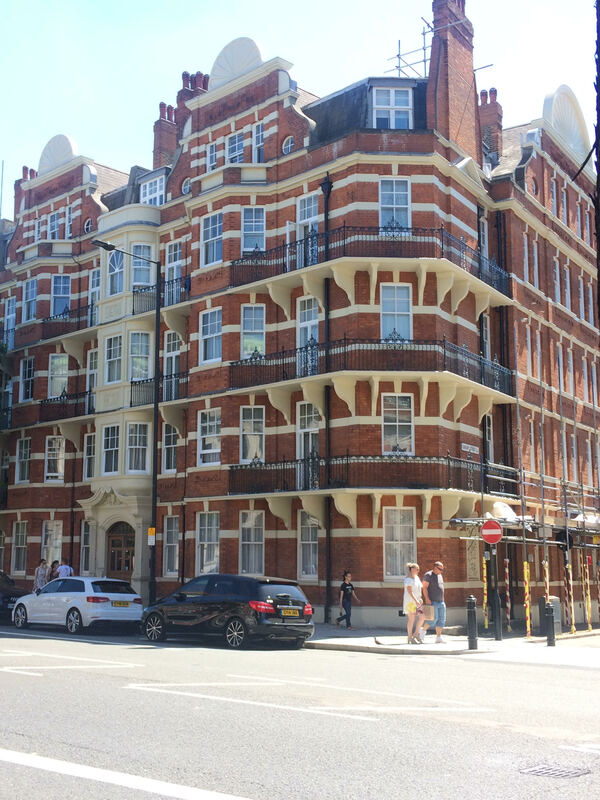 Importantly the principal access point to the offices above should be at the centre of the historic façade at ground level, the most logical place and benefit in activating the street frontage. The Olympia National’s vertical extension is likewise is dissociated from the historic building on which it seems arbitrarily placed. 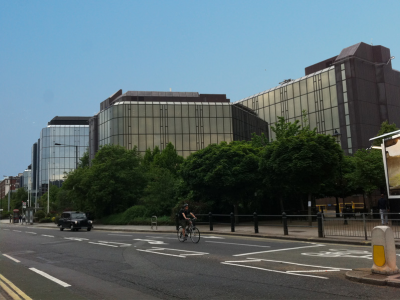 The east wing of this building provides a perfect opportunity to provide a generous terrace fronting the public space of Olympia Way and there needs to be a visual logic to the placing of the new storeys. The mismatch between accretive, organically-styled structures sitting over classically proportioned architecture below seems to suggest a lack of commitment to understanding the language of this historic facade. The listed buildings on the site are in danger of being downgraded to characterless pedestals. This side of the site seems to have benefitted from little appraisal of its potential to serve and engage with the locality. The proposed theatre has a blank face to the public realm along the length of North End Road with little interest other than arbitrary sculptural modelling. This is a completely inactive frontage. Add to this that the height of this wall is equivalent to at least 15 conventional storeys and its potentially depressing impact becomes clearer. The viability of a proscenium theatre layout might also be questioned. An internal layout ‘in the round’ would provide greater flexibility in use and allow for a plan that offers active frontage to the street. Alternatively a re-orientation of the auditorium would place public functions on the street side of the building. In any event this building simply needs openings facing the streets. It should not have principal facades devoted to servicing at ground level. A larger public space next to the street would also add a sense of civic inclusion (as described in the ‘Public Spaces’ section above). In principal a redevelopment should be supported as a bold initiative with the potential to improve both the Olympia facilities and the public realm beyond. However, with what is a particularly complex development brief, the best solutions available have yet to fully emerge. A significant problem is implied within the consultation vision statements set-out by two renowned architectural practices involved: that of developing and engaging with the site as a whole whilst at the same time being guided by the histories of the individual buildings contained in it. What has been lost in the current scheme is a sense of the individual buildings from ground level extending itself upwards into new additional storeys. Without retaining the individual character of each building in the block the development presents a blurred and incoherent image affecting its functioning on the civic level and the loss of heritage value. The high-level unifying space is physically dissociated from the public realm despite the best efforts to overcome this problem with design signalling. An echo of London’s Barbican Centre, or Paris’s Forum Les Halles (inverted) emerges; both are examples of major urban site where there is a fundamental disconnect between the surrounding urban fabric and the developed site leading to a decline in both. Both sites subsequently have had to make considerable efforts at great cost to mitigate this conceptual error. By boosting the qualities of the peripheral public spaces Olympia would give itself better options for access, engagement with the neighbourhood, business opportunities and sustained success. This is a large and complex site and a rush to redevelop should be resisted. A more sensible approach should be favoured with an initial Outline Planning Application with detailed building applications to follow later as separate applications. This will give the council a chance to investigate and appraise the proposed scheme with the time and resources that it requires. Residents and neighbours in the local area should be concerned that this mega-project will have a great effect on their quality of life for the foreseeable future. We hope they can support initiatives to make the changes that will improve the redevelopment for the benefit of all. Currently, for most local people, the Olympia Venue in Hammersmith exists in the background as a large grey blob. The paint-job on the Art Deco frontage couldn’t be worse. The only time local people notice Olympia is when it causes traffic chaos. The new owners of Olympia plan to change all this. They want to open the site back up into its separate, listed, historic buildings. They want to create public spaces within and around these lovely buildings over a 14 acre site. New indoor spaces including two hotels, theatre and cinema venues, community space, independent retailers, and new offices. Look at it all here – scroll right down for the most important visuals. My main concern is that treating the 14 acre site too much as a single “destination” with similar design themes could end up too much like a theme-park. Too much cohesive good-taste piled too high could bite its own tail in the form of kitsch….. Here are some things Olympia’s owners could do to avoid this. I’m worried that there is too much of a theme running through Olympia’s plans – being the curved Deco-like echo. Have a look at all the pictures to see this. Olympia could consider breaking out the scheme into its separate parts and ensuring that each building is beautiful in its own terms. Why should they all echo each other in an overly internally referential way? Each building should make references to the wider architectural heritage not just to each other. We know that the original Olympia buildings will look fantastic in 30 years – because they do now – apart from the horrible paint job on the Deco frontage. But what about the modern additions? I have never seen a modern building that has aged well. That is because they don’t seem to be able to settle into themselves. They are made of stiff materials and they remain perpetually stiff and upright even as they get old. They develop the quietly sad look of someone aging who is unable to let go of youth – like Gustav von Aschenbach in Death in Venice. This could be avoided if the architects specifically think about how the buildings will look in 30 and 100 years. Here on the right is one of the buildings opposite Olympia. What underlying principles helped this architect get it so right? Here is a picture of another building down the road from Olympia. What were the architect’s hopes for this building? They at least could have built in grip holes for ivy. No community likes a large space at its heart which they perpetually walk around, not into. The local community offering will be vital to give Olympia a beating heart. My preference is for a local museum and arts and history hub. I’ve joined class trips where children, parents, and teachers suffer for a day visiting the Science or Natural History Museum. Nobody says but everybody knows that nobody learns anything. It’s noisy and stressful and barely even pleasant. There is so much history and art history locally – let’s create a space for it. Having school kids coming and going from Olympia on a daily basis will really give it a beating heart. As will providing a meeting place for all the older people, who generation after generation, work to preserve the things they have loved. As a local councillor I sat in meeting where we “designed out” anti-social behaviour. Sometimes these meetings fairly overtly attempted to “design out” teenagers. We lock our local parks at night and I’ve always wondered where teenagers are actually meant to hang out. Our teenagers are Olympia’s future customers and future staff. Olympia would be doing all of us a great favour if they designed in places – eg along Olympia Way – for teenagers to be able to hang out, having bought a coffee or nothing. The current mock-ups of the new Olympia Way look a bit blank. We need some designed-in hanging-out space – something Thomas Heatherwick is clearly perfect for. There are lots of pockets of green space in Avonmore, Brook Green, and further north. But most of these are small and only one has a decent playground. When you are a mother at home with young children, you generally don’t want to go and sit in a peaceful green space and stare at the grass. After watching The Little Mermaid in the morning, like Ariel you want to be where the people are. So it would be good to put in seating / play equipment for carers and kids. I like the yellow seats along the South Bank that kids can also climb on. 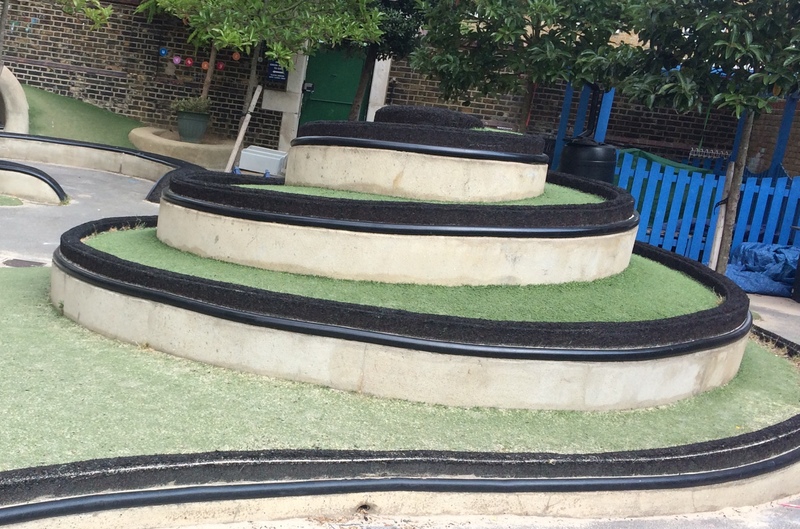 I love this spiral in a local school – this is perfect for mothers, kids, office workers to eat their lunch. I know Mr Heatherwick “could make us something like this but better. It even echoes the Olympia curves…. Our aim should be that Olympia becomes a place where local people hang out on a daily basis. We also want to know that it will look beautiful now and in a hundred years. Build it and we will come. “The next round of consultation on… the future of Olympia… will take place… on the 14th and 16th August between 4pm and 8pm and 18th August between 11am and 3pm. The consultation … will provide an update on the progression of design for the new theatre and performing arts space, public realm, offices, hotels, cafés and restaurants, as well as providing further detail on traffic management and how we have taken your feedback on board and into the proposals and overall vision for Olympia London.